This is the FREE, ad version of the BK Dictionary Slovak English dictionary. To remove ads please buy BK Dictionary Slovak English! 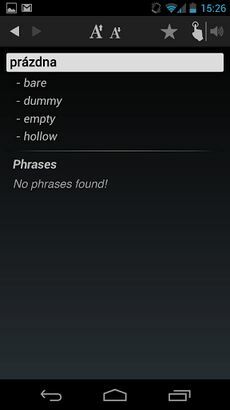 – Translate by Share functionality (FULL VERSION only): translate easily by sharing words with the dictionary from other apps. – Translate from Clipboard notification bar (FULL VERSION only): translate easily by enabling notification bar copying text to the clipboard and tapping on the notification bar.